I’ve been watching for additional shows to enter and a couple of years ago I had flagged the ‘Focus on Fibre‘, a biennial exhibition in Edmonton as a possibility. The 2016 theme ‘My Heritage’ was especially appealing as it fits so well with my current work direction. Over the past couple of years I have been working on a piece ‘just because’ I wanted to, without a schedule or plan for it! It fit beautifully with this theme. Thus ‘Ripples in Time’ came into being! I was thrilled to discover at the opening that I had received a second place ribbon for this entry. During a visit to childhood haunts along the Tay I recalled how the river influenced my formative years. The Tay, the river where I learned to swim at the age of five was a favoured canoe route between Christie Lake and the town of Perth, Ontario. An unfulfilled dream of a red canoe still survives! The family sugarbush hugged the shores of the river and provided a place to daydream and relive the adventures of ‘Anne’ of Green Gables fame. Water creatures, like those among the cattails, found their way into my classroom during my teaching years. Ripples in time began its life as a whole-cloth hand painted background. Texture to create the ‘ripples’ in the water was added with hand stitching and embroidery. For a while ‘Ripples in Time’ languished at this stage as I contemplated how to represent the maple leaves that I envisioned. As a result of an on-line course with Arlee Barr I was off to the races again. 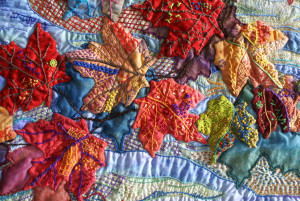 Each leaf was created individually, padded, then heavily ‘textured’ with hand stitching before applique to the background. 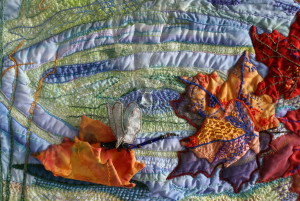 The leaves were layered, some created from sheers others from patchwork, others just stitched. 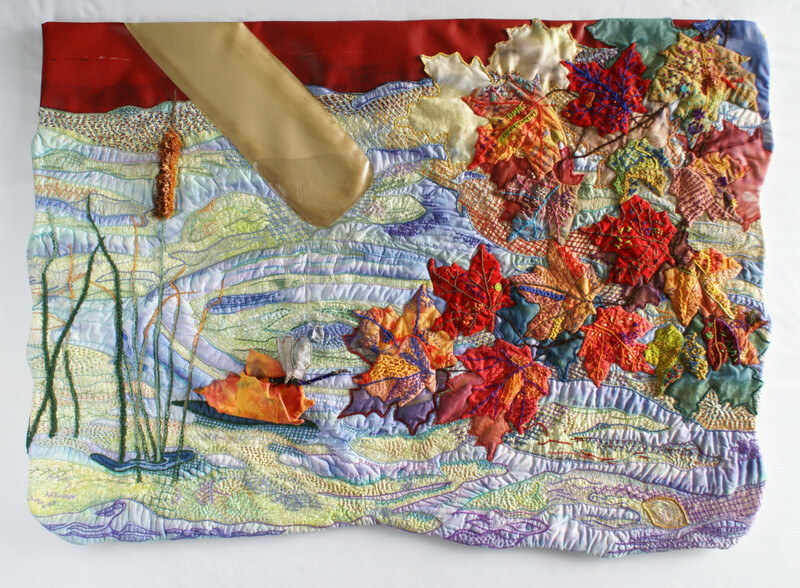 I added reflected colour to the water with hand stitching before appliqueing the leaves to the background. Cattails with a 3-D pod were created with dimensional embroidery and I still wasn’t satisfied. A red ‘vinyl’ canoe, a paddle with water dripping from it and a curled leaf with resting 3-D dragon fly were added and I was happy with it. Viewers may vote for their choice for a special ‘Viewers Choice’ award. Ballots are provided. Congratulations. This is a wonderful piece!